Sunday morning was exceptionally hectic. I had to get done the breakfast and the lunch box within 15 minutes. Breakfast was half way through and the lunch box was not even started. As hubby dear had some work through the day, I convinced to carry a lunch box. Even though I was all prepared to tackle it on time, there wasn’t enough in the end. This Thakali Sadam that I saw in Indo’s space had caught my attention and I was planning to do it. 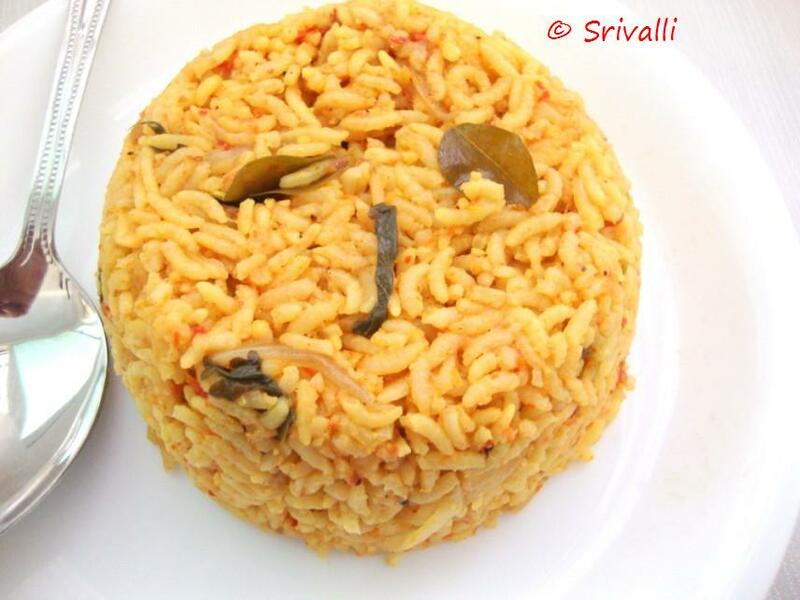 The recipe was almost similar to the Thakkali Sadam I make, but with small changes. Imagine to that I went and changed further more. Meaning it calls for Mint, while I had none. I happily forgot Ginger. Yes the rice came out very well. 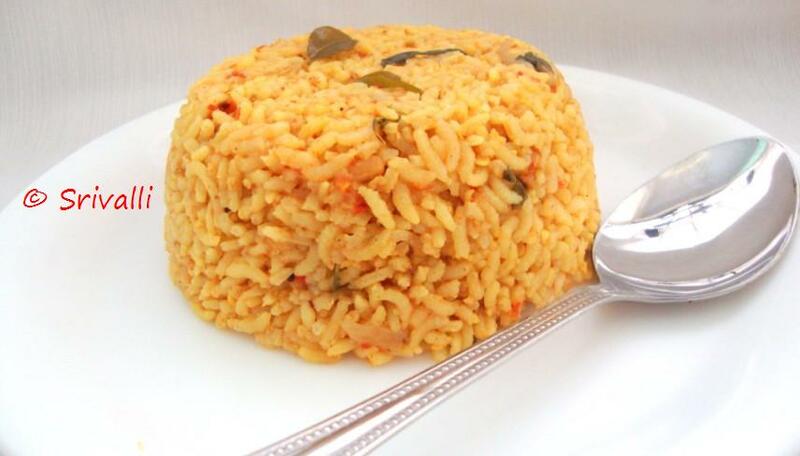 Chinnu was so happy that I made Biryani early in the morning. He wanted to eat that for breakfast but Poori Channa was tempting enough. Though he happily ate it for lunch and as an evening snack. He even asked for it for dinner, I know I am going to make this quite often. The 15 minutes I had was hardly enough for me to click in steps, so I have shot in different angles as I had some time after hubby dear left for work. Dry roast the spices and grind to a fine powder when cooled. Keep it aside. In a pressure cooker, take oil, add mustard Curry leaves, onions along with slit green chilies. Sauté till the onions start turning colour. Drain the water from rice and add to the pan. Sauté well for couple of mins. Meanwhile puree the tomatoes and add the puree to the pan. Add 3 cups of water, turmeric, roasted powder along salt. Garnish coriander leaves, Pressure cook till done. I normally put it on for 3 whistles. This tasted great on its own. But you can serve this with just plain curds/yogurt if you prefer. I didn’t add grated ginger and mint. We felt that ginger may have added good flavor too, so maybe next time I will add it. Do try this if you are looking for 15 mins One pot Meal! wow, that looks mouth watering dear. 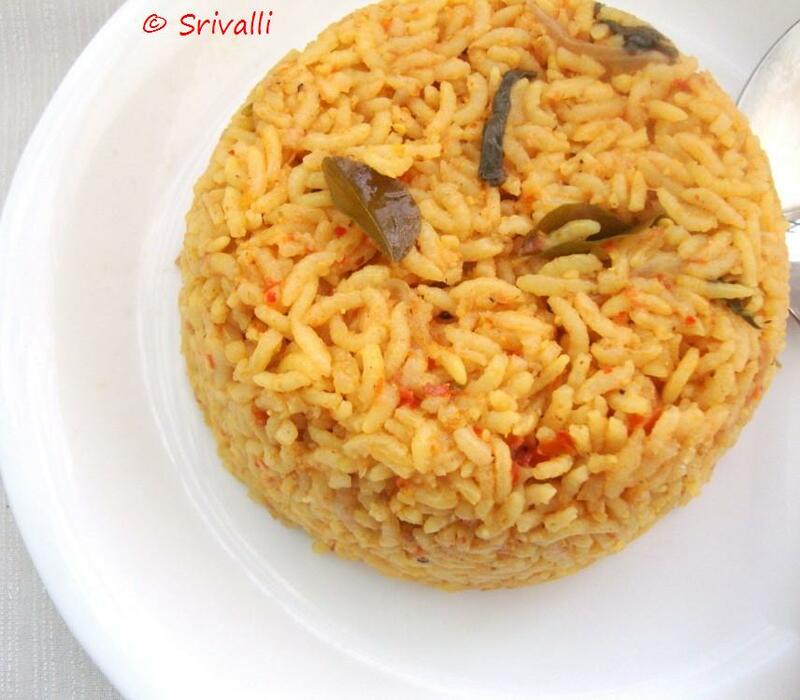 Thakkali rice in pressure cooker is indeed very easy. I love these one pot meals. Lovely presentation Srivalli. Love the variation in it. 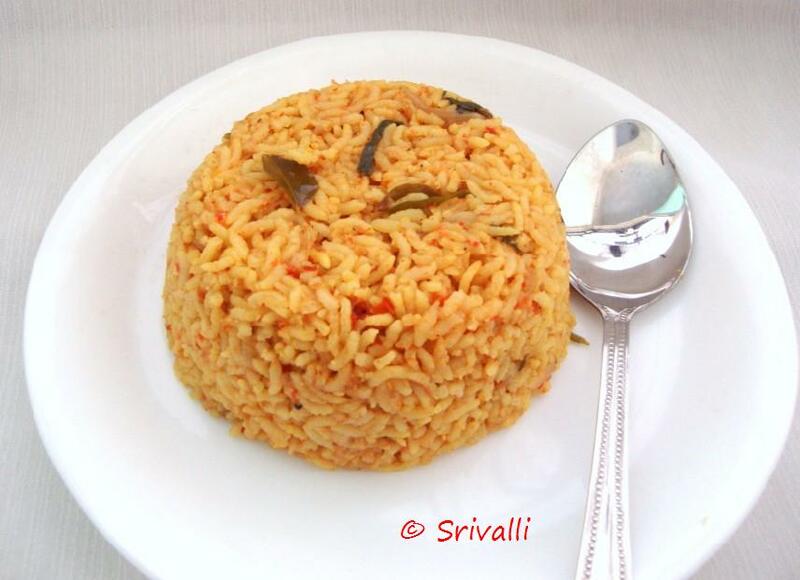 Thakkali sadam is one of my fav rice dish. My mom used to make just like this but without pressure cooking. I love your recipe , gonna try it soon. I tried this one.Very simple n tasty.